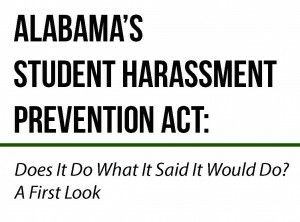 Click here to view “Alabama’s Student Harassment Prevention Act of 2009: Does It Do What It Said It Would Do? A First Look”, published in June 2012. Click here to view Appendix B from the report, which contains all harassment reporting forms received or obtained from Alabama’s school systems. Click here to view the press release announcing the publication of the report. Search for “bullying” or “anti-bullying” or “harassment” for all posts related to the Alabama’s Student Harassment Prevention Act.